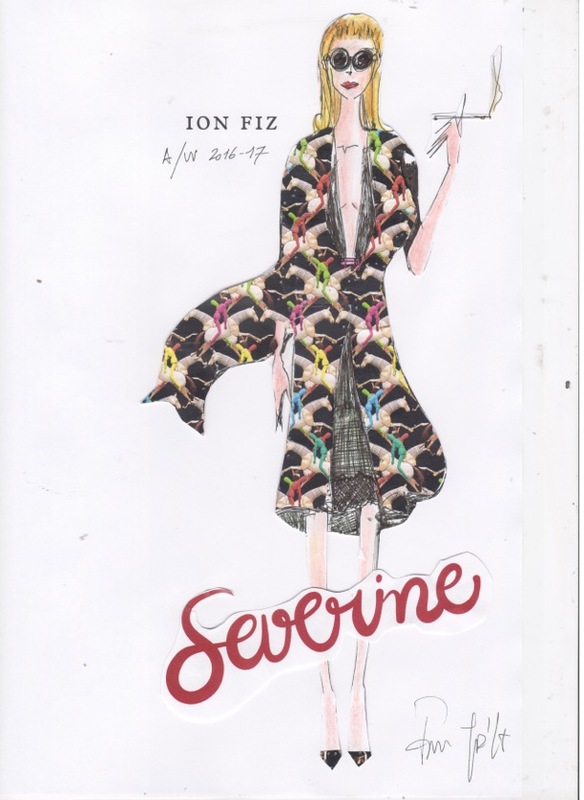 MADRID, SPAIN - ION FIZ AW 2016 collection was inspired by "Severine" character from the film Belle de Jour directed by Luis Buñuel and starring French actress Catherine Deneuve. The three-dimensional patterns of the collection as well as the set of the runway show were created by the artist Cristina Iturrioz. Biliana Borisova, a disciple of the Central Saint Martins, was in charge of the hat collection for the eighth time. Sketch from ION FIZ Autumn/Winter 2016 collection "SEVERINE"
Fabrics: silk, crepe, wool, cashmere, boucle, silk and muslin point. Colours: Cream, terracotta, ocher, green, pink, red and black. Accessories played an important role in the new collection: Ion Fiz opened his own line of shoes, bags and belts plus a new line of sunglasses manufactured by ION FIZ YODEL. Jewellery: Pieces created exclusively for the collection by BEATRIZ Milleiro.